I always love finding a Good Things Story in my inbox. As I open these emails, I’m excited to learn more about this person’s journey, about how she found joy after struggle. As I read Mary’s story, tears were streaming down my face. I’m so grateful that she bravely decided to share her truth! And when I realized that I would be sharing her journey during the holiday season… Well, the timing was perfect. 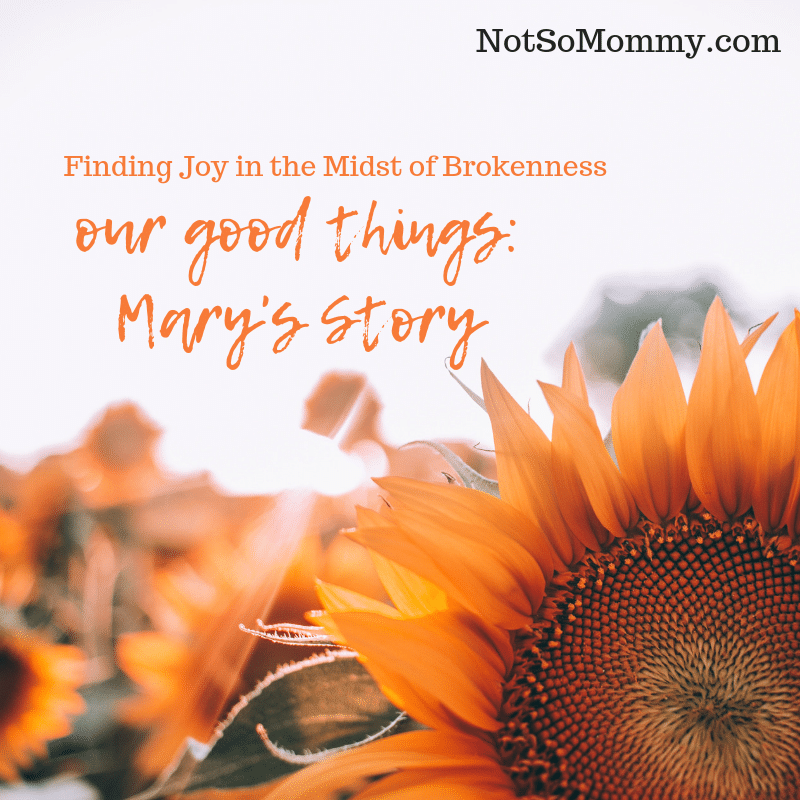 Mary’s story evokes tears of sadness, grief, and unfairness, but also joy, hope, and love. It is amazing! And I am so honored and humbled that she chose to share it with me and the Not So Mommy… community. I struggled most of my life with my weight. By the time I was a teenager, I was very heavy and was bullied in school, to the point of considering suicide. My faith is the only thing that kept me from actually going that far. At the age of 25, I was sick of myself and made a decision to change things. So, I began to go on a weight loss journey that changed my life in many ways. It gave me the courage to really be seen and live, doing the things I had always wanted to do, like learn to dance (not good, but I love it…lol), and be a teacher. I also felt more confidence, and stepped out of my shell and met the man I would marry. First, comes love, then comes marriage, then comes the baby in the baby carriage… Or so we thought. When I was a little girl saying that silly rhyme, I never knew how hard it would actually be. We started trying right away since I was 32 and my husband was 40 at the time we got married. When after a year we were not pregnant, we didn’t know it was unusual or anything to be alarmed about. We were blissfully ignorant, just dreaming, so hopeful each cycle that this would be the one. We let another year go by before we decided to seek medical help. This did give us time to save some money for what we had been researching, realizing quickly this was not a cheap or easy fix. After every possible test, and a couple of procedures to fix the “problems,” or what were thought to be the problems, we were going to have our 1st IUI. We were one of the lucky couples, who had success on our first try. Our first positive pregnancy test, followed up with blood-work that confirmed our family was going to be growing, from him and me, to three. My family was already talking about our baby shower. Everyone was so excited. And we were in love with our little one. We were ignorantly happy for one month, one blissful month. The wind was knocked out of our sails at our first ultrasound. We were told the baby was not growing properly, and we should prepare ourselves to miscarry. (Still not sure how you do this). But we could see “his” heartbeat on the screen, and this little blob was our baby. Two weeks later, I was in the ER and was sent home empty, with nothing. Two months was all we had! My younger sister was pregnant at the same time. We had the same due date, and she went on to have a healthy baby. (I am so thankful that I am blessed with 2 nieces.) What followed was a brutal year of ups and downs, both emotionally and physically, to get my body and mind into a healthy place. We decided we would try again–5 more times, 5 more IUIs, over a 5 year time span. We had 2 more pregnancies, also ending in miscarriages. During that time, I felt like the teenage girl that was being bullied–the girl who kept her head hung low in shame, the girl who would not add to conversation, the girl waiting for herself to be better, to be thinner, to have the nicer clothes, before she could live and be happy. Before she was worthy. Before she was permitted to be a part of life. 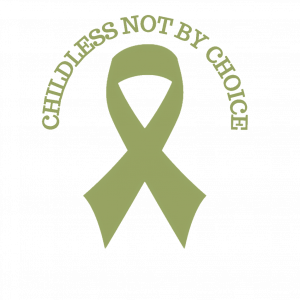 Only now, infertility and pregnancy loss was that bully, telling me that I wasn’t enough, and I wouldn’t be happy until I had a baby. We got into the habit of saying when have a baby, we will take that family trip; when we have a child, we will take him to the theme parks, etc. I was realizing there was always going to be something keeping me from being happy, keeping me from living fully, if I let it. Life is so imperfect. Rarely does it work out the way we hoped or planned. Searching the internet and social media, I tried to find help, or support, or just someone who understood. I felt so alone. I did find some loss groups. At first, they helped me feel heard, but quickly I realized, I never felt better. My grief was stealing all of my joy, and I needed help. I came upon a book called “Finding Your Muchness.” It was such a help to move me in the right direction. I have come to realize all of these wonderful sites, Not So Mommy… included, are lights in our darkness, that can help to lead us out. But, we have to do the work. And we have to do it everyday, as we choose what we are going to feel, how we are going to react, to life’s imperfections. If we are going to be happy and have peace in our hearts in the midst of brokenness, in unmet dreams, and the like. We also have to be ready to do it. Two years ago, I wasn’t ready. But, I’m ready now. I started small, as silly as it may seem, with brightly colored, glittery nail polish. I liked it, but would never have worn something so wild. So I did. And when anxiety and sadness would hit, I would look at my nails, and it would remind me that if I could find joy in something as silly as nail polish, there was so much more I could find it in, if I chose to look for it. In my loud music with a great beat to dance to, in my nieces’ giggles, in my classroom full of children. But if I wasn’t ready to see it, then I wouldn’t. We are all at different steps on our journey. Coming to the path of being ready to find my joy again, was also at the end of our journey to become parents. 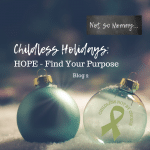 When I decided that I was done, that I wasn’t trying anymore medical treatments or procedures, and adoption was not an option, there was a grieving process that I had to go through. Our focus for the last 9 years had been consumed with this pursuit and it has not been easy to change this. It continues to be a daily process. My first step in the process of letting go of our hopes of having a child was for my husband and I to go to the Grand Canyon. We kept saying over the last 9 years we wanted to go, and maybe we would someday. It was part of our dreams and plans that we would talk about… When we have kids, we will go here on vacation, we will do this, and that. Inside, I felt this intense need to just go. We had to do this now. I was tired of always waiting to be happy. So, we planned a road trip from Florida all the way to California and back. We traveled to 11 states in 9 days, and it was amazing. As we drove, I literally would choke back tears at times, because I felt like I was leaving something behind. And I was. My dream to mother a child was now in the rear view mirror. But I was also moving forward into something new. The choice to live and be happy and enjoy life now, in whatever was happening–in the messiness and the dysfunction and when it doesn’t go as planned. I have to make a choice each day, to hold on to my inner peace, to live in gratitude, and to see the joy in each moment. Sometimes I fail miserably. But as long as I keep moving forward and don’t stay stuck in my grief, then I am headed in the right direction. And that’s all I can do–my best. I would tell others to find the things that bring them joy. Think back to a time that something really made you happy, and do more of those things. At first, it was really hard for me to think of something because I was always doing everything for everyone else. I remembered how much I loved to dance and ride roller coasters. So, those are two of the things I started to do again. My husband and I took dance lessons together, and we got passes to a theme park and frequented it as much as we could. Start small, but just start. Don’t stay in the dark. “Don’t stay in the dark.” I couldn’t love that more! 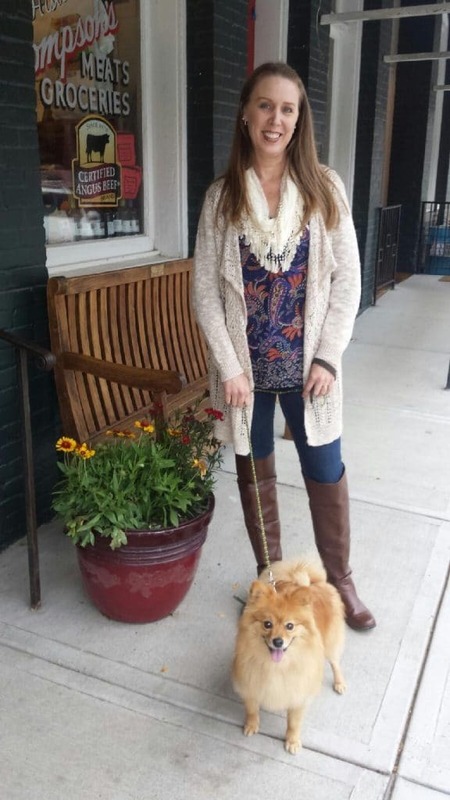 Mary, again, THANK YOU for sharing your story! You are an inspiration! If anything Mary wrote resonates with you, please tell her about it in the comments. If you’d like to inspire others and share your Good Things Story, click here to find out how. Start small, but just start. Such wise words that can help when life pushes us down. I am in awe of your strength. I wish you joy.